Already accustomed to outsourcing non-core functions like housekeeping, parking and payroll to focus time, money and effort on delivering care, healthcare organizations are increasingly turning to IT managed services as well. In transferring the responsibilities of technology and infrastructure, they have reduced costs, increased efficiencies and improved care. Healthcare organizations have reaped the most benefits from IT managed services by tailoring their solutions to their needs, putting themselves in front of the trend instead of passively waiting for the outsourcing to happen. Cost savings is always a driver for adopting IT managed services. Indeed, organizations can reduce operating costs by 20% to 45% if they avail themselves of the right tools and services. But organizations must be careful about looking at cost. Instead of just looking at the managed IT services contract and assuming that they will get the reductions promised, CIOs must take responsibility for achieving the cost savings. Unless CIOs start turning things off or transferring them to the managed services group, they won’t see the ideal cost savings. They must transfer that service and then reduce that expense overall. Infrastructure and applications managed services are particularly fruitful areas for achieving cost savings. A predictable, highly structured delivery model that is innovative, agile, modernized and ready for the future needs of the healthcare organization produces maximum impact. IT managed services can drive returns on investment in the form of higher availability, dependability and accuracy with existing or even reduced staff. Safety and accountability can be improved as well. If an organization is struggling in some areas to retain staff or engage staff or get their level of productivity up, sometimes they can offload that to a managed services organization for help. Managed IT services solutions also can include advanced monitoring and management capabilities that improve management of enterprise IT in healthcare environments. Such solutions provide IT leaders with the complete visibility into the health of their environment that they need, so that they can take immediate corrective action when gaps are identified. In doing so, managed IT services can support the continuous improvement that is vital to the continued advancement of healthcare IT services. 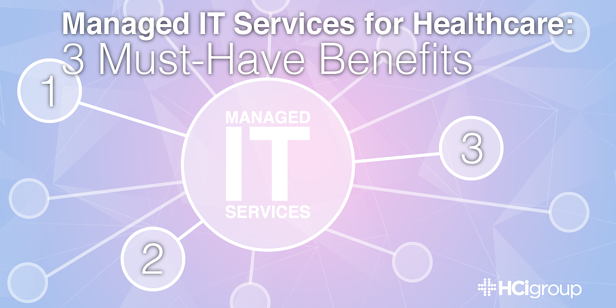 Many healthcare organizations get into managed IT services initially for cost alone. But they eventually find that once they get those cost savings, they still must either maintain or increase the quality of service that they provide. While cost is always important, when quality is on the line, especially related patient care and operating in a hospital or a hospital system, it’s quality that comes first from a CIO’s perspective, followed by efficiency and cost. Providing the best care for the greatest value with optimal efficiency is challenging for any healthcare organization, particularly when competition and compliance are thrown into the mix of competing demands. But, proactively adopting IT managed services can increase the return on investment in even the most transformative of projects by reducing increases, increasing efficiency and improving care for organizations.